Wedding planning can seem to be neverending. But don't worry, you're having your wedding in San Diego and what could be better than that. Let us help with your transportation plans with our San Diego Wedding Bus Shuttle Rental Services. We can help cover rides for your entire wedding party, bride and groom, family and guests. 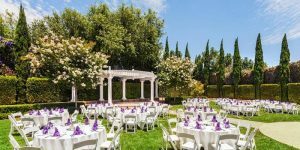 San Diego Limo Rental also offers Wedding Discount Packages for Wedding Getaway Cars, Wedding Limos, and Wedding Shuttles when booked together. We guarantee you will have an amazing time with any vehicle we set you up with at The Lowest Limo Discount Rates in San Diego. We receive every type of request for Weddings so we know what to expect. Choose from our wide selection of San Diego Wedding Shuttle Limo Rentals to transport the Bride and Groom between the Ceremony and Reception or as a Wedding Getaway Car. We have White Lincoln Limos, White Escalade Limousines, White Chrysler Limos, and more! Looking for something a little different? Check out the Classic Vintage Cars, Luxury Sedans and Luxury SUV's available for all Wedding Transportation. Many people do not think about adding buses to their Wedding Itinerary to Shuttle family and guests between Venues. Many places have minimal parking or the location is tucked away and sometimes difficult to find. San Diego Wedding Bus Shuttle Rentals is a great choice to help with all these potential hassles. Have your pick from many shuttle buses and charter buses up to 56 passengers. Reserve one or multiple buses to shuttle between locations during the entire day or night. We even have Mercedes Sprinter Vans up to 14 passengers for smaller group shuttles. And of course, don't forget about our popular San Diego Wedding Party Buses, where the celebration never stops. Just ask any of our amazing sales representatives for further information. We have perfected the way we price out Limo Transportation Services in San Diego. 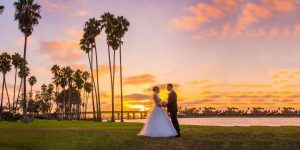 San Diego Wedding Bus Shuttle Rental Services Pricing can easily be determined using our internal software with prices that have been intricately negotiated with multiple Limo Companies throughout San Diego. All Limousines, Sedans, and Buses are available with Point to Point Rates, One Way Transfers, Hourly Service Rates, and Hybrid Pricing.